born imaginative. : Thrifted. Updates. Randoms. GIVEAWAY!!!! Melissa and Doug Puzzle. Four miniature baskets (that are regularly used for feeding play horses). Four brand new garden tools for kids. A restoration hardware brand new pickup truck, price tags still on it. A tie. And this pillow. More to tell about this pillow. Grand total: $7.00. So, the pillow. My little 3 year old never asks for gifts for himself while we're out and about. He always wants to get gifts for his mama, though. If my husband brings him to the store, they almost always come home with flowers or a special treat for me. Not my husband's idea, but my 3 year old's. Well, he picked this pillow. Carried it around. Was convinced it was perfect for his mama and that I'd love it. It wasn't something I would pick out, but he was so convinced it was perfect for me. I couldn't crush his spirit and refuse. You know what? Brought it home and placed it on the couch. It really is quite perfect. He knows what he's doing. You should have seen him beam from ear to ear when I told him I loved it. Boots. Poem and vintage Mother Goose. A wooden box and an extension cord. And more Mother Goose books (we're obsessed), as well as four other best sellers. $4.50. We have snow, snow and more snow. Although days are getting longer, it's still dark very early. That's the life in Maine in February. But, we're making the best of it. We're getting outside. We're making elaborate meals (and desserts!) to warm our bellies. We're using our freezer stash. We're finishing projects, reading books, playing games and giving the sewing machine a workout. We're garden planning and summer dreaming. But not moving so fast that we forget to embrace winter. The pace winter sets is much appreciated. Just a couple pics of my loves on a horse drawn wagon ride. Would have been smart to take a picture of the horses too, huh? 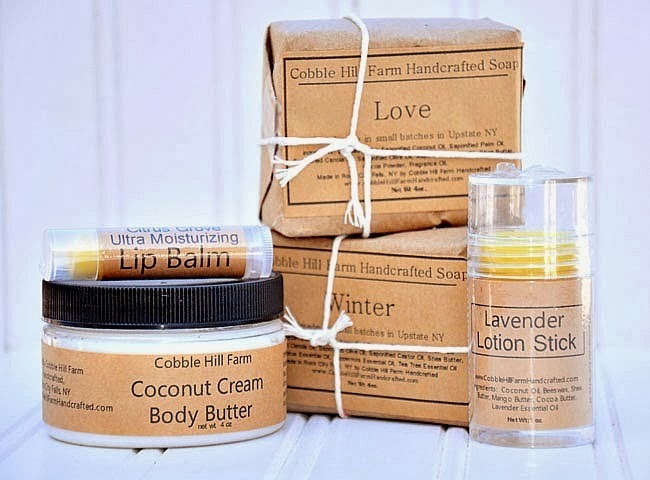 I have been wanting to try Cobble Hill Products since I started following her blog a few months ago. I'd love to try these. They look wonderful. I always get excited seeing your thrift shop finds you know how much i like a good deal! Your giveaway is also exciting seems like some great products I would love to try them. I have tried those products before as well and can vouch that they are amazing! I've been using the body butter so much lately with my dry winter skin. Everyone should enter! It is so sweet that Adrian picked out that pillow for you. I have to say, he did a great job! It really does go well on your couch. I distinctly remember getting a gold chain-link bracelet for my mom for Christmas one year because I was certain she would like it (I think I was 7 or 8?). My dad wasn't so sure about it, but let me get it for her anyway. Kids know best! Thanks so much Jackie. The pillow story is just the cutest!! Your thriftings are awesome! And please enter me in the giveaway...looks like great stuff. Awesome give away and finds! Looks like lovely treats! Thank you for your giveaway! This looks like a wonderful basket of goodies. I would love to win this. Especially the cream. Thanks for hosting. I'd love to be a winner! I am addicted to these kinds of products.